WINARNI, 74 years old, comes from Indonesia. She found out that there was a mass on her left side of breast during a self examination, about 2cm, flexible and there was pain when pressing. Considering her old age, WINARNI though that it was normal for her to have some small discomforts, but she did not ignore it and went to hospital in Djakarta for examinations. After taking B ultrasound in Djakarta, she was diagnosed with breast cancer. At the age of 70 years old, she become much optimistic and was not scared by the sudden cancer. She just took some medication to control her condition instead of going to seek for better treatments. She said that her tumor shrank after taking the medication, but the condition was still worse. In June 2014, her tumor became bigger, and she felt tired and was in a low spirit. On June 18th, physical examinations showed that her tumor has metastasized to the internal mammary node of the left side and axillary lymph nodes. Her condition was critical. Although WINARNI accepted the harsh reality, her husband and children never allowed her to give up and wait for death. Considering the risk of operation and the failure experiences of her friends, WINARNI and rejected to take operation and decided to look for better non-surgical treatments. One day, her daughter Diana occasionally browsed the website of Modern Cancer Hospital Guangzhou. “Is there anything we could help?” the greeting from the website of Modern Cancer Hospital Guangzhou started the predestined relationship. After deeper understanding interventional therapy, cryotherapy and other minimally invasive therapies, accompanied by her two daughters, she came to Modern Cancer Hospital Guangzhou for treatments. In July 2014, WINARNI was hospitalized in Modern Cancer Hospital Guangzhou. The multidisciplinary team (MDT) of Modern Cancer Hospital Guangzhou quickly arranged her some examinations and specially made her a suitable therapeutic plan. After taking interventional therapy for one month, WINARNI’s condition was under well control and allowed to leave hospital. 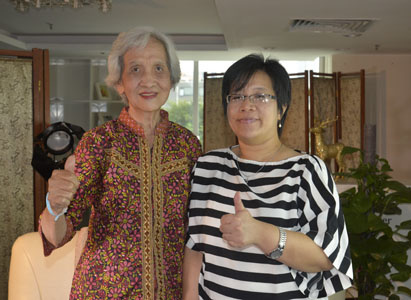 WINARNI came back to Modern Cancer Hospital Guangzhou for other treatments one month later, and her condition became much better after another two months of treatments. WINARNI and her families were happy about that; she said that she is in a good condition now, her weight increased; her spirit became better and she no longer feared of cold. 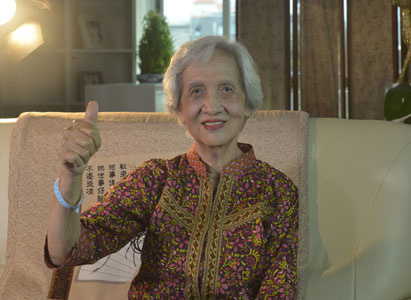 It has been more than one year; WINARNI is still in a good condition, now she just came to Modern Cancer Hospital Guangzhou to consolidate the therapeutic achievement. She sincerely showed her gratitude to her resident doctor Qu Yuji, her two doctors and her husband, they all gave her a lot of help and support.